When running a warehouse, efficient use of space is paramount and an efficient pallet racking system can provide numerous benefits. What does this mean? It means making the most out of your square footage while taking into consideration conditions such as product selection, bulk storage needs, last in, first out (LIFO) and first in, first out (FIFO) inventory control needs, and product accessibility. Different pallet racking systems provide different benefits; take a look at the many benefits of pallet racks to find the appropriate system for you and your company. Pallet racking systems are a great way to capitalize on warehouse square footage. Pallet racks provide the ability for you to store vertically, placing pallet bays on top of each other. The maximum height of these systems is dependent on a number of variables. That is weight of the product, height of the warehouse, and reach of pallet movers. With added vertical storage a warehouse can easily multiply their storage capacities. Not only do these systems provide vertical storage but they also provide different heights for each pallet level. Whether your pallets are packed short or stacked high, pallet racking systems have the ability to fit all the required pallet sizes. If your warehouse contains a wide range of SKUs which need to be accessed, the standard selective pallet racking system would be a great option. This type of storage rack system contains multiple pallet bays each housing one pallet each. These bays all have forklift access along an aisle way between rows as pallet rack rows are most commonly arranged back-to-back. This mean each aisle provides access to two rows of pallet racks. These pallet racks are most beneficial for warehouses where the SKU selection is large, but each individual SKU does not have a deep inventory. 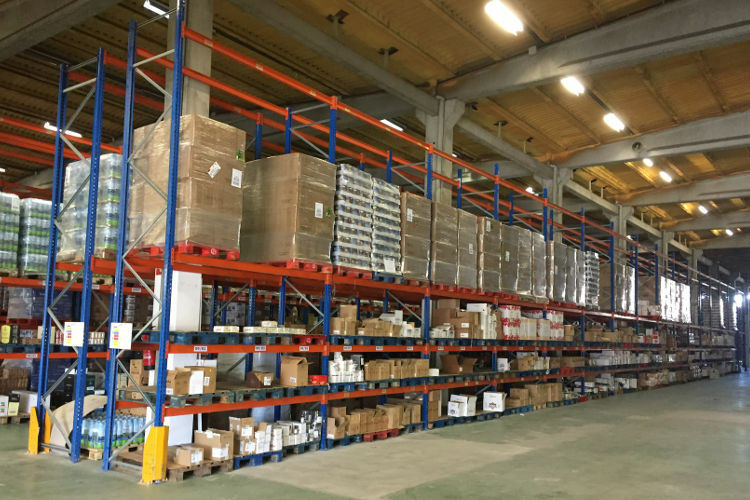 Warehouses which have deeper inventory needs, that is, inventory with fewer SKUs but higher inventory of those SKUs, will have their needs fulfilled though different pallet racking systems. There are a number of systems which provide the ability to store a high density of product SKUs including push back pallet racks, pallet flow racks, and drive-in or drive-thru pallet racks. These systems all have their own benefits to specific areas of need, especially when concerned with inventory control. Drive-in and drive-thru pallet racks provide even more storage space than traditional pallet racks. These similar systems allow for bulk storage in each row, eliminating the number of aisles needed to reach product further increasing storage capacities. A drive-in or drive-thru system increases storage capacity by 7 times compared to floor stacking and 3 times compared to the other pallet racking systems. A drive-in pallet rack provides forklift access on one side and are best for last in, first out storage systems with deep inventory. The drive-thru pallet racks are set up similarly to the drive-in system however they allow access from both sides of the pallet bays. This setup increases the flexibility of the available storage space and provides first-in / first-out storage. Different inventory has different needs and must be treated with these different needs in mind. For example, goods which have an expiration date cannot sit around in the warehouse as pallets with farther expiration dates are packed in front. Inventory without expiration dates are much better suited to being stored over longer periods of time. 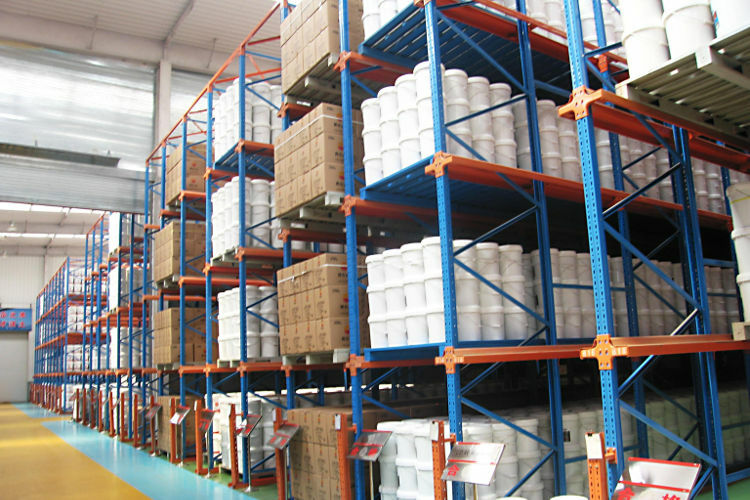 There are a number of different pallet racking solutions which can help you manage your inventory flow. Push back pallet racks are a way to store multiple pallets in the same pallet bay. Each bay is equipped with a system of rollers which are angled towards the front of the rack. When a new pallet is added to the bay it pushes any pallets already in the bay back. Likewise, when a pallet is removed any pallets in the bay slide forward and become the front pallet. These systems are a great way to store multiple pallets of the same SKU and make the most sense for last in, first out inventory control. If your perishable inventory requires a first in, first out system there are also pallet racking systems for that application. Again, if you are looking for a deep inventory of one SKU in a first in, first out system a flow rack will provide you with the best solution. In these systems, a pallet rack is loaded from one side and unloaded from another. The rack itself has a set of rollers on an incline which takes a loaded pallet and slides it towards the unloading side. As each side can either be loaded or unloaded the pallets are strictly stored in a FIFO order. No two warehouses have the exact same needs. 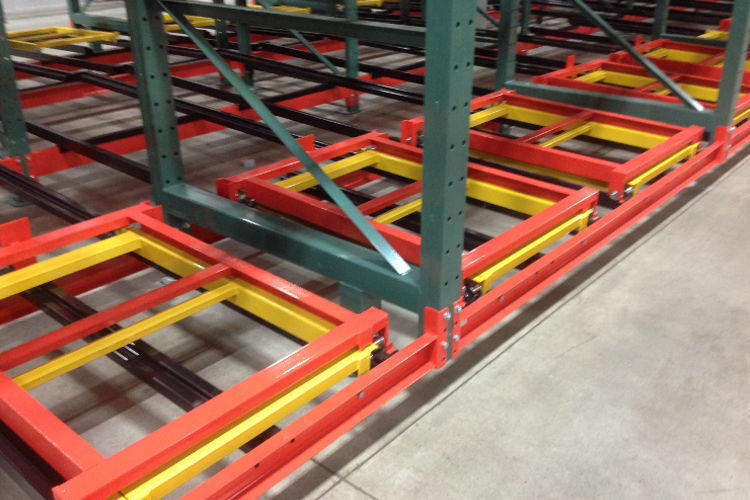 The wide range of pallet racking options means you can customize your warehouse to fit your specific needs. Depending on your needs, you may need to implement multiple types of pallet racking systems within your warehouse system. The furniture giant IKEA has done a great job implementing the correct pallet racking system for their needs. 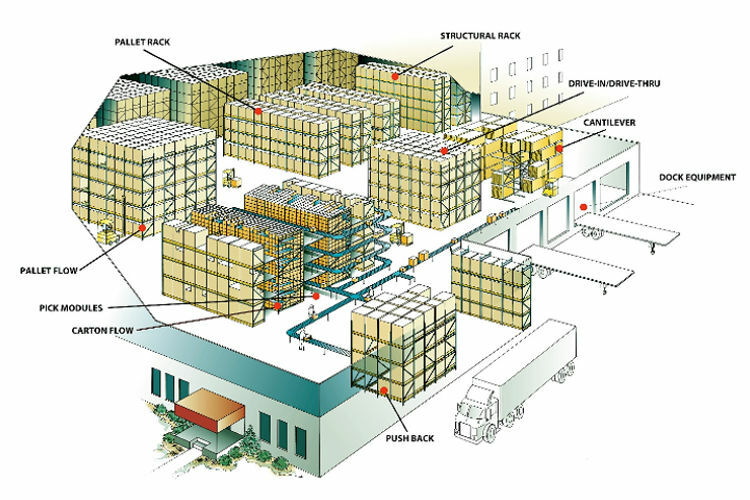 They know their high and low flow products and have created a storage system to maximize their warehouse storage. It’s no wonder they are one of the most efficient retailers in business. 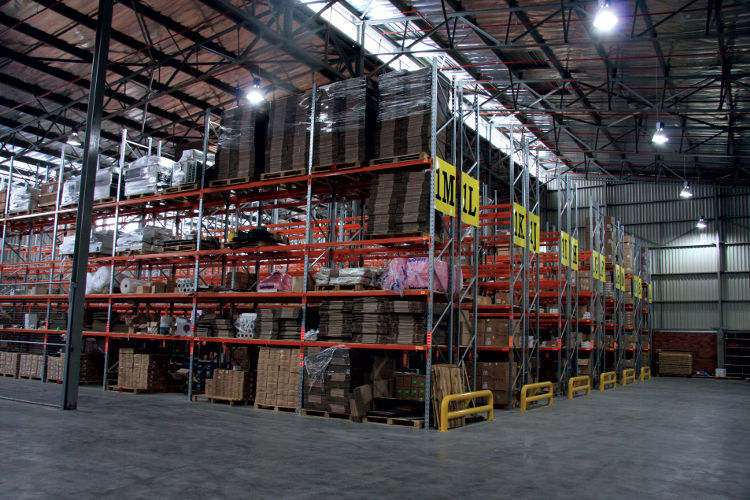 One benefit of implementing the correct pallet racking system is an increase in your warehouse safety. When you and your safety team work together, the ability to create a safe warehouse skyrockets. Some safety areas to consider include pallet and load weight, forklift operations, height restrictions (overhead plumbing or electrical fixtures), and worker logistics. When you take into consideration all of the appropriate logistics you can be sure your new pallet racks will increase warehouse safety. Pallet racks are custom designed to meet your particular height and weight capacity needs, allowing storage of nearly any pallet-able load in a sturdy and reliable system. When looking to install a new storage rack system you also want to be sure to take into consideration your forklift operations. Things such as any height restrictions or load restrictions will impact your safety considerations. You also will need to be aware of any overhead obstacles which may limit rack height. Finally, having a well laid out warehouse will allow your workers to be safer as they will have less travel time to and from different items in the pallet racks. Increase storage within your given square footage which decreases the amount of money needed on rent. Keep better track of inventory control systems, eliminating lost pallets or pallets left past their expiration date. Keep your warehouse more organized, reducing the amount of time your workers spend going from pallet bay A to pallet bay B. Having a properly laid out storage rack system will end up increasing productivity and product movement, which in turns decreases your costs and increases your profits. When you are looking to outfit a new warehouse or refit a current warehouse, pallet racking systems provide many benefits. These benefits include increased storage capacity, easier systems for inventory control, greater organization, and increased safety. If you are looking for a better storage rack system we can help. Please call us at 877-247-2934 or visit our contact page. What Is The Difference Between A Mezzanine And A Modular Office? What Is An Automatic Storage Retrieval System And What Are The Benefits? What Is An Automated Guided Vehicle and What Are the Benefits?